Reconciliation date – if you’ve just moved over to KashFlow and have been using previous accountancy software then you’ve most likely reconciled before; you can set the date to which you have previously reconciled up to by going to Bank > Edit Details > Advanced Options > Set the Reconciliation Date to the date that you previously reconciled up to, the start date will be the day after this. If you’ve found that your reconciliation start date doesn’t match the end date of your previous reconciliation that it’s likely one of the details above have been edited. Follow the steps below to correct this. Modify your reconciliation date to be the same as the end date of your last reconciliation. First click Bank > Reconcile > Previous Reconciliations and take note of the last reconciliation end date. 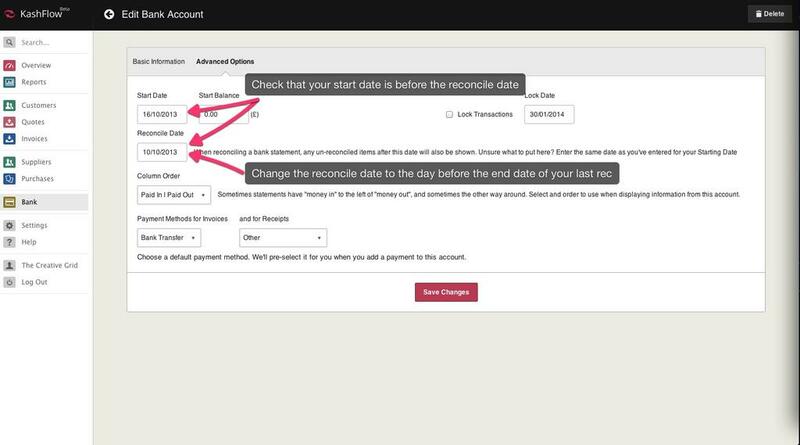 After that go to Bank > Edit Details > Advanced Options and check the start date is before the reconcile date, then change the reconcile date to be the same as your previous reconciliation end date. After that, click Save Changes. Please note that the bank account start date must be before your first bank transaction in KashFlow.